Here’s something that we marvel at every day at our Orem, Utah pregnancy ultrasound clinic: it’s a technology that’s completely safe for both you and your baby. In fact, after over 60 years of use and millions of ultrasounds being done on babies and their mothers, there have never been any negative effects documented. All of this technology allows us to spend some special time with the pregnant mother and help her get images of her child (or children!) in the womb. The early pregnancy scans that we perform in our office, such as 2D ultrasounds, 3D ultrasounds, and 4D video ultrasounds, give parents an early view of the miracle while leaving the child perfectly protected and safe. What makes ultrasounds so safe? Let’s take a look at the technology behind these scans and why ultrasounds are so popular and common. How Do Pregnancy Ultrasounds Work? An ultrasound uses ultrasonic frequencies, sound waves that are above the range of human hearing. (Subsonic would be the opposite of ultrasound.) The transducer is a wand that is moved around on the body, and this wand produces ultrasonic waves. It also receives the waves as they bounce back from the inside of the body; these waves are then interpreted by the onboard computer in order to display an image. Some people call ultrasounds sonograms, and we certainly don’t have a problem with that. What’s the difference? The technology and the frequencies it uses is the ultrasound, while the picture it produces is called the sonogram. In most cases, these terms are used interchangeably. One of the most common questions we get (besides “is it a boy or a girl?”) is “what’s the purpose of the jelly?” It’s actually a critically important part of the ultrasound, and images can’t be obtained without it. Air is a (relatively) poor conductor of sound, and, as we discussed above, ultrasounds use high-pitched sound frequencies to work. Any air — and we mean any — that comes between the transducer and the skin is going to cause interference with the ultrasonic signal. The glycerine jelly transfers the ultrasound signals up to 500 times better than when no jelly is used. Why Are They So Safe? Ultrasounds are so safe because they use no ionizing radiation. That means that there’s no threat of cell damage (and subsequent cancer dangers) like you might get with x-rays. Ultrasounds and MRIs are two of the only types of diagnostic imaging that don’t use ionizing radiation. While it’s good to keep your exposure to x-rays down as much as possible, there has been no danger associated with ultrasounds no matter how many you have. That’s why women who have traditional 2D ultrasounds performed by their doctor still come into our ultrasounds clinic in order to get 3D ultrasound portraits and 4D ultrasound videos made of their unborn child. Besides creating pregnancy sonograms, ultrasounds are used throughout the medical field. They’re used to study soft tissues in the body, such as abdominal and pelvic organs, as well as the heart. They’re also commonly used to diagnose problems with muscles and tendons. Ultrasound technology has been around for more than 60 years, and during that time scans have become cheaper and more portable. The resolution is also higher, though they still fall behind CT scans and MRIs for the highest-quality images. On the plus side, an ultrasound contains no ionizing radiation like a CT and doesn’t cost $1000+ like an MRI! What’s the Difference Between The Pregnancy Ultrasounds We Offer? We offer a variety of ultrasound packages at our Orem office. Here are the differences between the types of technology we use every day. 2D Ultrasounds – 2D sonograms are often thought of as “traditional sonograms.” These are the kinds that you’ll often see at a doctors office. Some women choose these because of the cost savings, but others want to compare the images to sonograms they got of themselves when they were in the womb decades ago! 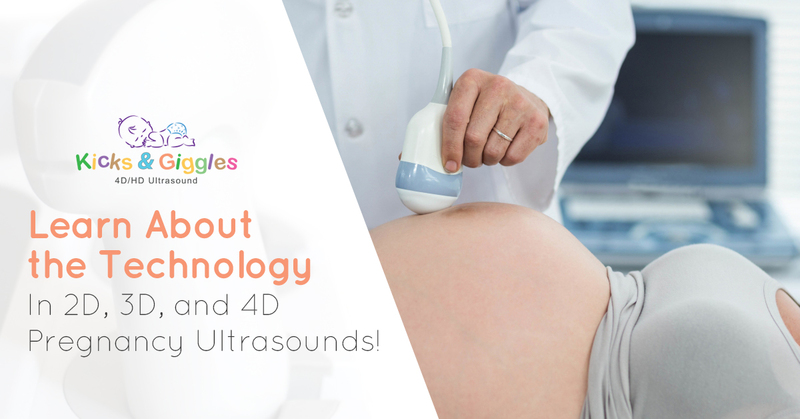 3D Ultrasounds – 3D sonograms are a wonderful technology that’s leaps and bounds ahead of traditional black and white ultrasounds. These images show a child in all three dimensions and provide a better picture of what the child actually looks like in the womb. Think of this as a portrait of your child! 4D Ultrasounds – 4D sonograms take the three dimensions we just talked about in a 3D sonogram — height, width, and depth — and ads the dimension of time. In other words, it a video! These are so much fun to carry around on your phone and share on social media. To learn even more about the difference in these types of pregnancy ultrasounds, click here! Ready To Meet Your Child? If you are ready to see what your child looks like right now, we’re ready to help. Schedule your pregnancy ultrasound appointment today!